Star pattern bricks were used to pave many sidewalks in the older districts of Richmond. The bricks held up well because they were glazed when baked. This prevents water, ice and snow from getting into cracks, causing them to freeze, thaw, and break apart. Many of the sidewalks have been replaced with concrete today as it is less likely to "heave" with tree roots. The Star bricks continue to be used as an accent in the downtown area as a nod to our heritage and can still be found serving as sidewalks in some districts. 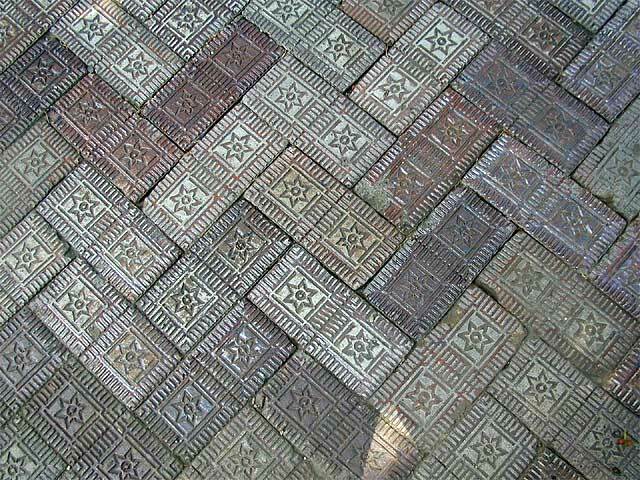 While no known record exists of who the manufacturer was, it may well have been the Nelsonville Brick Co., located in Nelsonville, Ohio from 1880 to 1937. Photo taken September 2000 in front of the Wayne County Historical Museum, 1150 North "A" Street, Richmond, Indiana. Palladium-Item - Sunday, February 6, 1966, page 12, "Few Facts Known About Brick Sidewalks"